The first summer club field trip is just around the corner. June 16-17, 2018 – Ocean City Maryland Air Show – You can purchase tickets to be at show center or shoot from the boardwalk or outside roped off area for free. Show center is 16th Street. There are shuttles that run from West OC park and ride straight to 16th St. http://ocairshow.com/ This year the Thunderbirds are the main headline. A show you won’t want to miss. Through a combination of exhibits, displays, tours, video and photographic presentations, archive materials and, of course, streetcar rides on authentic Baltimore streetcars, the museum gives visitors a compelling sense of how previous generations traveled throughout the growing metropolis of Baltimore. A permanent collection of Baltimore street railway vehicles and artifacts represents one of the most comprehensive histories of an American city’s transportation past to be found anywhere. Normal hours of operation are noon until 5:00 p.m.
Museum admission is $10.00. The admission fee entitles visitors to unlimited streetcar rides, plus access to the visitors’ center with its displays and museum store, and, when possible, a carhouse tour. Open every Saturday 11am- 4p. Admission is FREE! Tours $8. Guests can enjoy the latest exhibitions in the galleries and view the artwork which lines the 15-floor staircase. 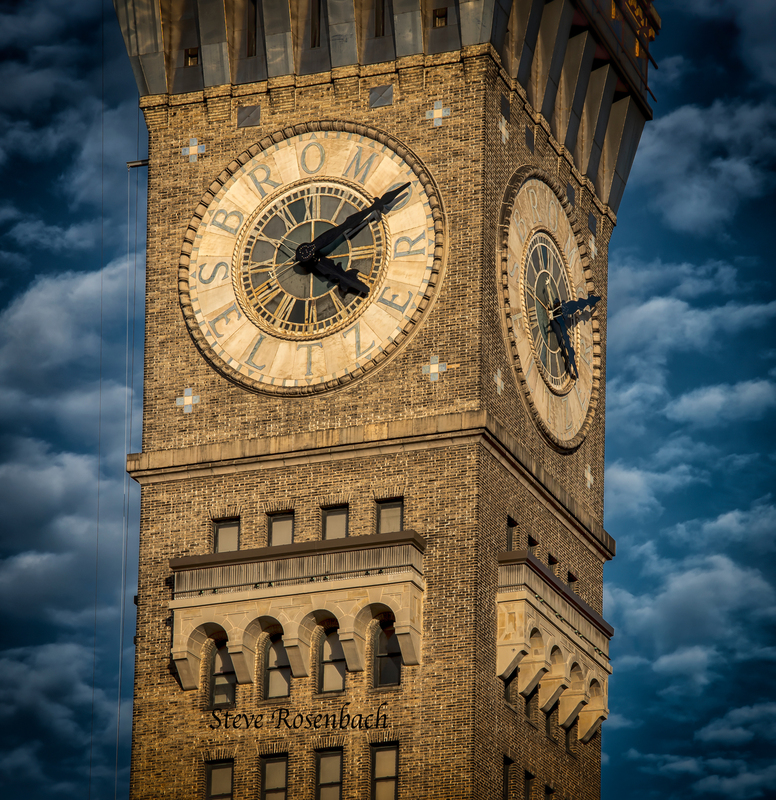 A forty-five minute history presentation presents the colorful, well-known Baltimore figure, which is behind the iconic tower the clock and his famous headache remedy Bromo Seltzer. The Emerson Tower comes to life as we share humorous stories which highlight the forward thinking business and marketing strategies of Isaac Emerson. The presentation starts with a video and ends on a very high note as guests climb to the 16th floor via a “ships ladder”’ into the marvelous industrial mechanical room clock room, which houses the clock mechanism, the elevator switchboards and motors. Guests are encouraged to bring their cameras to capture the 24-foot clock dials as a backdrop. Visitors can also take in the recent reinstallation of the iconic clock hands by the Balzer Family Clock Works. Tours cost $8. Access into the clock room is by ships ladder which requires that each guest sign a liability waiver stating they are aware of the danger of climbing the ladder. Please arrive 10 minutes prior to the tour you wish to participate in. Guests are encouraged to check out the history museum on the 15th floor and the artwork throughout the building before or after their tours. ** If you are planning on coming Let me know so I can schedule us if our group is 8 or more. 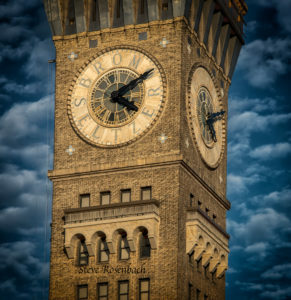 There is art for the creative souls in your group, plenty of history that brings 1911 Baltimore back to life, and a behind-the-scenes look at the largest four dial gravity driven non-chiming clock in the world for the mechanical engineer or clock enthusiast. The building is accessible to the 15th floor by elevator. The clock is NOT handicapped accessible. Just fill out the reservation form, return it to us, and we’ll do the rest. We look forward to sharing our amazing tower. On Saturday February 24, starting at 9:30am club members will converge on Chip Bulgin’s studio in Baltimore where we can shoot table top still life, portraits of each other, models, discuss post processing, and do lighting tutorials. Address: 3500 Parkdale Ave. Baltimore, MD 21211. The building is on the right-hand side of the street. It’s an old 3 story brick building that used to be a mill. There is a parking lot just past the building up a concrete ramp that has approximately 10 spaces. There is also parking on the street. 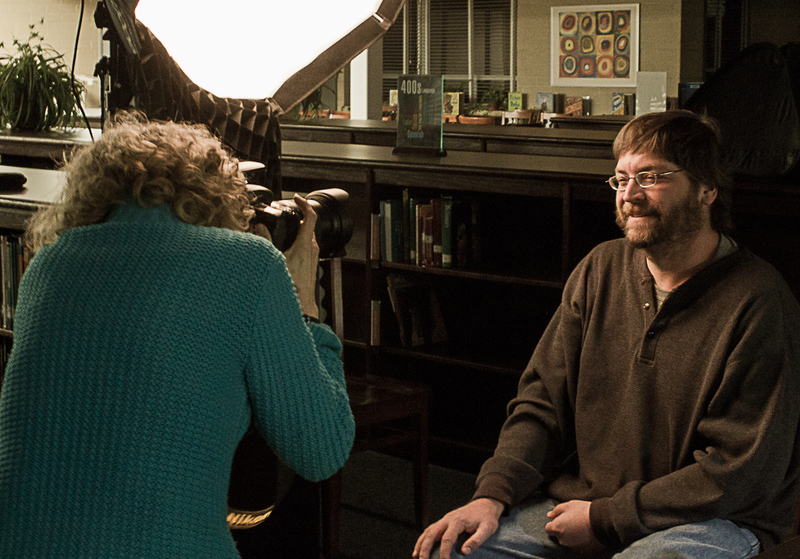 We will be doing studio photography with strobe lighting.We will have have several stations/sets available for photographing both human and still-life type objects. Fred is bringing four models. Feel free to bring your own lights if you have them. Also feel free to bring stuff and/or people to photograph. You will need a camera with a hot-shoe and a short prime (fixed) or telephoto lens. Something like an 18-55mm, 50mm, 85mm, 18-135mm, and the like should be perfect. For tabletop club members will bring their cameras and stuff to photograph. Flowers and food are always popular. If you have strobes bring them. Also backdrops and tablecloths can be useful. If you are attending or have any questions, please send an email to Bob and Susan Webber our field trip chairman at fieldtrips@arundelcameraclub.org. On Saturday February 17, club members will go to the Franciscan Monastery of the Holy Land in America. 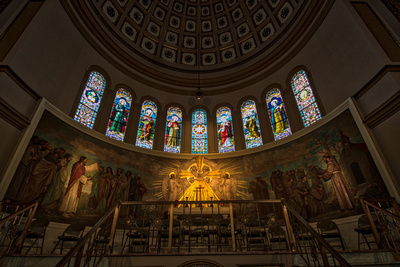 Located in Washington, DC, the historic Monastery is the U.S. home of the Holy Land Friars who, for 800 years, have cared for the sacred shrines and the Christians in the Holy Land. Visit the monastery to explore the full-size replicas of Holy Land shrines, beautiful church and contemplative gardens. Visitors are welcome to enjoy the main church and gardens on their own, but you can also go on a guided tour, which includes an introductory video, “behind the scenes” information and access to places not visible without a guide including the catacombs. Reservations are not required for groups of 6 or less. You may take photos for personal use in church. You may take photos during the tours, but without tripods. (Tripods require advance permission.) When taking photos during tours, you may not disturb the tour guide or other visitors, or you will be asked to stop taking photos. Plan to arrive about 10 AM get a the lay of the land and aim for the 11 AM tour. Click here for directions. Monday – Saturday: 10 a.m., 11 a.m., 1 p.m., 2 p.m., 3 p.m.
Sunday: 1 p.m., 2 p.m., 3 p.m.
At all times, regardless of where you are in the Monastery, be respectful of others who might be praying and/or in confession. Eating and drinking are not allowed in church. Cell phones must be silenced, put on vibrate or turned off. Photography for personal use is allowed. Commercial photography, video recording and/or tape recording must request special permission. Personal belongings must remain with visitors at all times. No items may be left in the lobby, such as umbrellas, lunch bags, backpacks, strollers, etc. The Monastery is not responsible for lost or stolen belongings. There are no eating facilities on the premises. There are, however, several restaurants and an organic market located nearby on 12th St., N.E. Address: 3500 Parkdale Ave. Baltimore, MD 21211 Studio M.
We will be doing studio photography with strobe lighting.We will have have several stations/sets available for photographing both human and still-life type objects. Feel free to bring your own lights if you have them. Also feel free to bring stuff and/or people to photograph. You will need a camera with a hot-shoe and a short prime (fixed) or telephoto lens. Something like an 18-55mm, 50mm, 85mm, 18-135mm, and the like should be perfect. Email me if you have any questions regarding equipment. I just received a message from my studio partner. We have no power in the building where our studio is located. The landlords don’t expect it to be back on until Monday afternoon, so we’ll need to cancel our outing tomorrow. We’ll reschedule at our earliest opportunity.